On the 29th January 1536, Catherine of Aragon was buried at Peterborough Abbey, now Peterborough Cathedral. 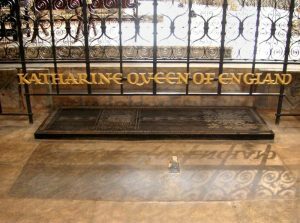 Her marriage to King Henry VIII had been annulled in 1533 so she was buried as the Dowager Princess of Wales, not as Queen, but her resting place is now marked “Katharine Queen of England”. 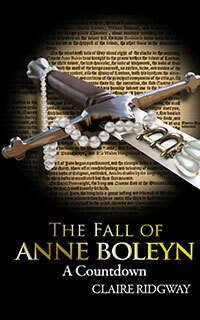 Also, on this day in 1536, Anne Boleyn suffered her second and final miscarriage, losing “a male child which she had not borne 3½ months”. It was a devastating blow for Anne and the King, who was desperate for a son and heir, but there is no evidence that this baby was deformed in any way. Did Anne find Henry with Jane on his lap on this day too (sending her into a mad rage, prompting the miscarriage?)? Or is this just a colourful story? The Catholic recusant Nicholas Sander, writing in Elizabeth I’s reign, recorded that Anne Boleyn’s miscarriage was caused by her anger and sadness at finding Jane Seymour sitting on Henry VIII’s lap, but he also wrote that Anne had six fingers, a wen and a protruding tooth, and that she’d had affairs with her father’s chaplain and butler before being sent abroad, so I think we need to take it with a pinch of salt. We just don’t know. It certainly seems to be taken for granted by most film makers, but then it is good gossip and it must have been something more than the jousting accident that shocked poor Anne as her miscarriage is a few days later. I would not be at all surprised.